TUFS was chosen in 2016 to participate in the 'Initiative for Realizing Diversity in the Research Environment', Funds for the Development of Human Resources in Science and Technology Project, and has since been actively providing support towards the research activities of female researchers. As a step towards female researchers being recognized on the global stage, the importance of English presentations at international conferences is growing. 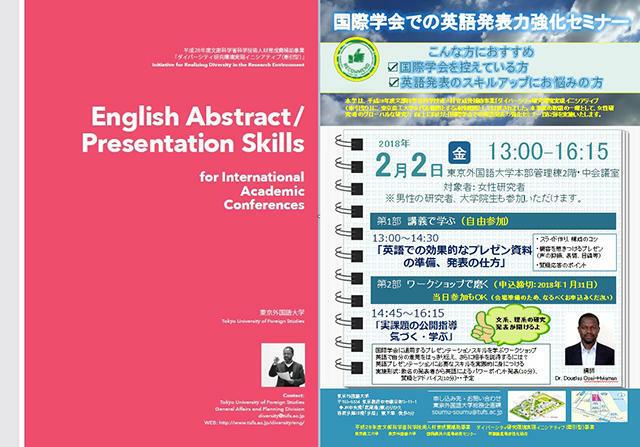 To support this, TUFS has established a 'Seminar on English Presentation Skills for International Academic Conferences'. With last year's seminar focusing on 'How to Write an Effective English Abstract', and this year's on 'English Presentation Skills', this seminar has proved to be popular with both TUFS students and students from partner institutions. Recently, to assist researchers (both those who participated in the seminar, and those who could not), a pamphlet containing two years' worth of seminar content was published and distributed to TUFS' partner and network institutions. While this pamphlet is of course useful for female researchers, its content is applicable and useful to all researchers who give presentations at international conferences (including both male and student researchers). For inquiries concerning this pamphlet and seminar, please contact us via the information below.